Some army wife friends and I have started a wonderful new tradition, which hasn't been officially named, but I privately refer to it as Ladies Night In. The title basically gives away the whole concept. We're all ladies (in the sense that we're females, haha!) and instead of going out, we relax together inside. With food. And wine. And excellent conversation. Throw in the occassional dirty joke, and we've got a party! To add to the fun, we rotate houses each week, so we all have a chance to host. This means we each enjoy a great meal every week, but only have to cook once a month. Totally win - win. Of course, I agonize for weeks before it's my turn, wondering what I should make for my friends. You recently got a sneak peek at our dinners with Michele's guest post: Roasted Vegetable Couscous. This is what I compete with, people! It ain't easy, I gotta measure up, right? So far, I've made a lot of soup (like my Creamy Onion, and a new roasted zuchinni soup that I'll tell you about sometime). Oh, and finger foods. I love finger foods. Sadly, dessert has always been my issue. I like eating dessert, but the cooking of it? Not so much. I don't know why, but the whole idea ties me up in knots. What if it's not good? What if it's too sweet? Dear God, what if it's not sweet enough?! Yeah, it's a real problem. On Ladies' Night though, I'm stuck. So, I've been forced to expeiment with my dessert skills. This last time, I was so pleased with the results, I decided they were good enough to share with you! Nom nom nom nom.... Homemade Orange Sorbet! Served in a fancy, biodegradable orange cup, ha. The serving style definitely elevates this simple dish into something more unique, don't you think? 1 cup of water. 1/2 cup of sugar. The peel of 1 orange (I used my veggie peeler for this, super easy! Try not to have any of the white pith on the skin as you peel, because it's bitter and yucky. 'Yucky' is the technical term, ha). You also need 2 tablespoons of fresh lemon juice and 2 cups of fresh squeezed orange juice, about 8-15 oranges, depending on size. Before you ask, the answer is YES, you MUST use fresh orange juice. Ok, so maybe not. I guess you could use the stuff in the carton, but I take no responsibility for your final product if you do so. The beauty of this sorbet is its delicate flavor, and I worry that concentated juice will upset the balance. To make your sorbet base, start by adding the water and sugar to a pot on the stove over medium-high heat. At first, the mixture will be cloudy. 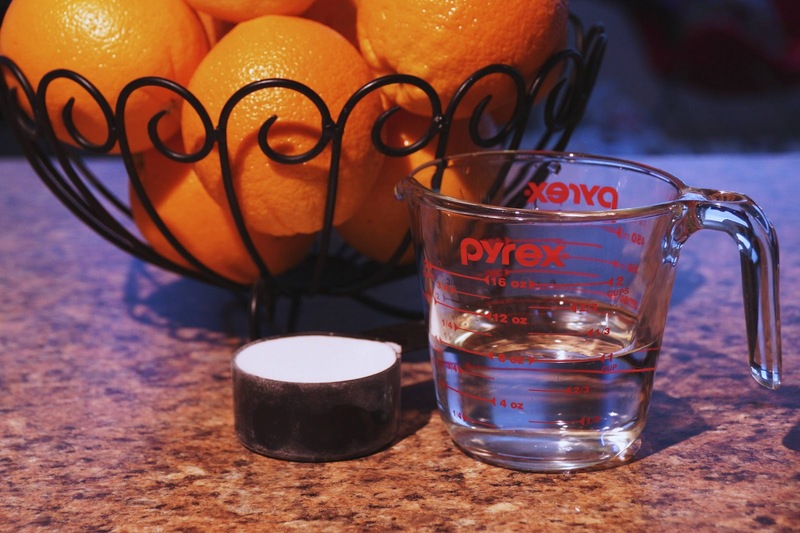 However, as you bring it to a boil, the sugar will dissolve and once again appear clear (see photos below). 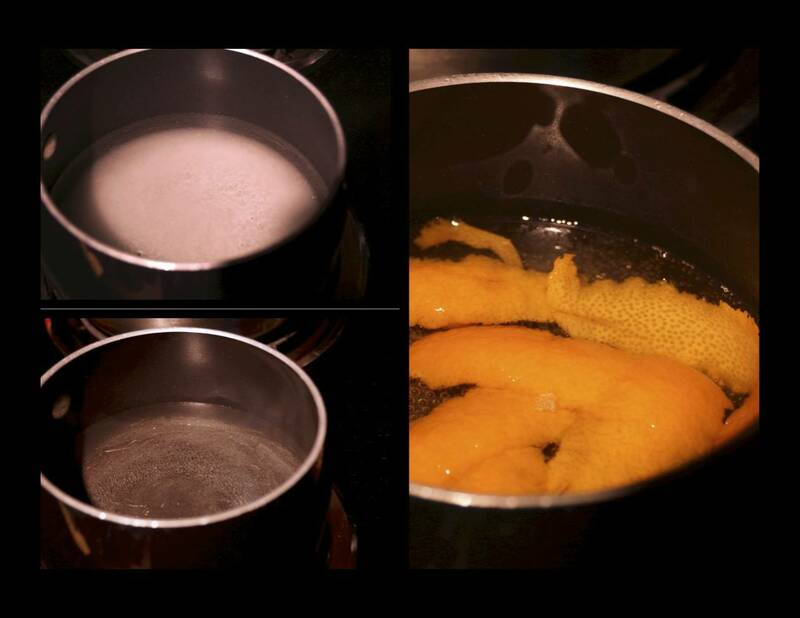 When the sugar/water reaches a boil, add your orange peel to the pot and reduce heat to a gentle simmer. Simmer for five minutes. Remove from heat, strain the orange peel out of your mixture, and let the syrup cool. Once cooled (this doesn't take very long, maybe 15 minutes), stir the orange and lemon juice into the syrup. Combine well, then place in the refrigerator to chill completely. I've left mine to cool anywhere from 3 hours to 3 days. This sorbet base will keep in the fridge for several days, so it's easy to make in advance then toss into your ice cream maker when you're ready. From here, simply follow the instructions on your ice cream maker. I allow mine to churn between 15 and 20 minutes. Eat right away or scoop into containers for freezer storage (Note: If you freeze the sorbet after churning, allow the sorbet to soften on your counter for a few minutes before serving. Sorbet freezes hard, and those few minutes will make scooping much easier). Slice a thin piece off the top of the orange, run a sharp paring knife around the inner rim, then scoop out the insides with a spoon (Hint: you can juice the pulp for your sorbet, or just eat the yummy wedges of orange). Be careful not to poke a hole in your "cup". If your orange doesn't sit flat, shave a bit off the bottom to level it out, also being careful not to poke a hole in it. Nobody wants melty sorbet leaking onto their fingers, right? 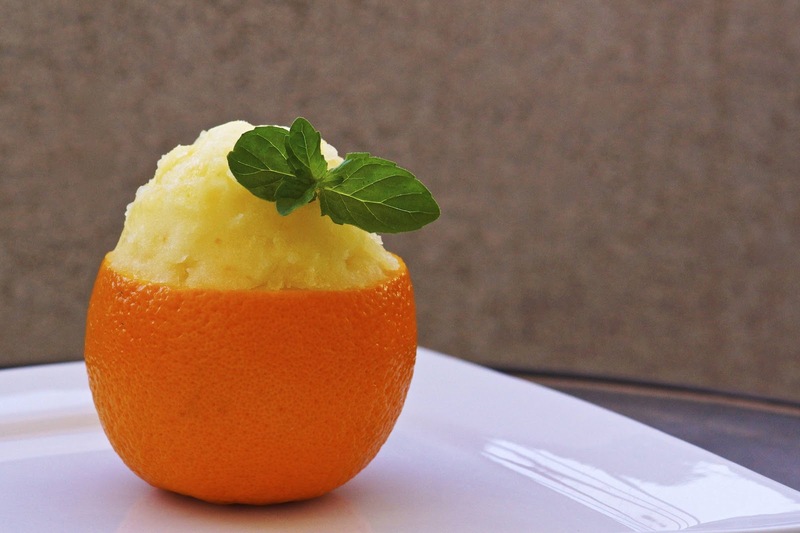 Then, pop your orange cup into the freezer before adding any sorbet. The hulled out oranges freeze quickly, in about 20 - 30 minutes. If you place them in the freezer just before churning your sorbet, they will be ready for filling when your ice cream maker is done. Why do I love these orange cups? Well, they're obviously adorable and snazzy. BUT, they also help keep the sorbet frozen, especially on hot summer days. Cool, huh? I knew you'd think so too. And that's it... simple, yet delicious. Plus, with the orange cups (and mint leaf), you look fancy and will impress your friends. Happy cooking, my friends. If you try out this recipe, feel free to send in your photos and I will post them for everyone. I love hearing from you! Combine the water and sugar in a saucepan over medium-high heat. Bring to a boil, then add the orange rind. Reduce heat and simmer 5 minutes. Strain the syrup to remove the rind. Allow to cool. Once cool, stir the orange and lemon juice into the syrup. Chill in refrigerator at least three hours and up to three days. Follow directions on your ice cream maker for churning (mine churns 15-20 minutes). Serve immediately in orange cups (directions below), or place in freezer for future use. If freezing, allow sorbet to soften on the counter a few minutes prior to serving. This will make scooping easier. Slice a thin piece off the top of the orange, run a sharp paring knife around the inner rim, then scoop out the insides with a spoon (Hint: you can juice the pulp for your sorbet, or just eat the yummy wedges of orange). Be careful not to poke a hole in your "cup". If your orange doesn't sit flat, shave a bit off the bottom to level it out, also being careful not to poke a hole in it. Garnish sorbet with a mint leaf if desired.